With both of these teams sitting with a 10-19 record at this stage of the season, it will come as no surprise to learn that they are both out of the running for the playoff spots. This may mean that some people will think that this is a nothing game with only pride at stake but sometimes these are the most exciting games to watch. You don’t often get a Euroleague game with nothing riding on it and you can guarantee that there will be plenty of people looking at this one in the hope of seeing points, thrills and action. These two teams have only met once before and of course, that came earlier on in the season. The German side grabbed a brilliant away win, taking the game by a score of 75-90. There was a massive 18 points from Janis Strelnieks but sadly he is injured at the moment and won’t be able to take part in this game. It has been a difficult season at times for Brose Bamberg but they have kept fighting to the end, which is another reason why this should be a game that is worth tuning into. The Turkish team has lost their two most recent games in the Euroleague so they will be desperate to end on a win to stop this season from fizzling out in a disappointing manner. This is a game between two teams with very weak defensive records so we should hopefully se attacks on top, which always makes for a more exciting time for fans and neutrals. Darius Miller has been a key player for the Germans this season, offering an average of 12.2 points per game while Nicolo Melli has offered an average of 11.3 points per game and 7.6 rebounds per game, which sees him leading the league in rebounds. The Turkish side have been led by Vladimir Micov with an average of 11.2 points per game while Sinan Guler has offered an average of 10.3 points game. 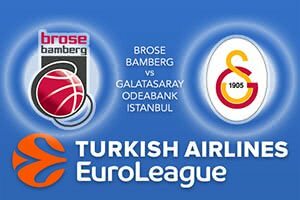 The hosts will fancy doing the double over their Turkish opponents so take Brose Bamberg at -5.5 at odds of 1.90. If you’re looking for the Over/Under market, go OVER 164.5 which is provided at odds of 1.90. Bet Now!